Jessie Chandler, age 99, 6801 Middlebrook Pike, Knoxville, passed away peacefully while sleeping on Thursday, April 12, 2018 at West Hills Health and Rehab. She was a daughter of the late Wesley and Zipporah Taylor Guinn. Jessie lived most of her life in Unicoi County before moving to Johnson City and Knoxville, where she enjoyed sharing residences between both her sons and their families. She retired in 1980 from Morrill Electric after fifteen years of service. Jessie also worked at Temple Hill School for several years cooking for the students. Jessie was a member of both Shallow Ford Baptist Church and Central Baptist Church in Erwin. She enjoyed being an active member in church and she loved teaching the children and helping with the nursery school babies. Jessie was a loving and devoted wife, mother, grandmother, sister and friend. She took so much pleasure and enjoyment from cooking meals that always seemed to “multiply” for the exact number of guests, who were lovingly invited into their home for an after Sunday church meal. Jessie was known for having the best pickled beans and corn you had ever eaten in your life! While living in the Shallow Ford community, Jessie loved going fishing with her family in South Indian Creek and catching a mess of her favorite Horney Head fish then, serving them up for a delicious family meal. 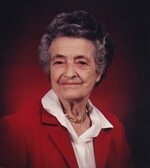 In addition to her parents, she was preceded in death by her husband of fifty-nine years, Howard Chandler on August 4, 1998; one son, Eddie “Ed” Chandler on March 18, 2010; three brothers: Orville, Theodore and Merley Guinn; four sisters: Iva Foster, Lena Hensley, Gertha Edwards and Oneda Martin. She leaves behind to cherish her many years of wonderful memories, one son, Joe Chandler and wife, Betty, Knoxville; daughter-in-law, Judy Chandler, Johnson City; two grandsons: Erik Chandler and wife, Kim, Caleb Chandler and wife, Stephanie; one granddaughter, Geri Grissom and husband, Scott; three great grandsons: Wesley Grissom, Elijah and Jude Chandler; three great granddaughters: Abbigail and Kendall Chandler, Emily Grissom; several nieces, nephews and cousins also survive. The family will receive friends from 1:00-2:00 PM on Tuesday, April 17, 2018 at the Robert Ledford Funeral Home Chapel. Reverend Joe Chandler and grandsons, Erik Chandler and Caleb Chandler will officiate at the 2:00 PM celebration of life service. Music will be provided by Inez Chandler. Interment will follow in the Roselawn Memory Gardens. Family and friends will serve as pallbearers. Flowers will be accepted or those wishing, may make memorial contributions in memory of Jessie Chandler to any church or favorite charity. Robert Ledford Funeral Home, 720 Ohio Avenue, Erwin, is privileged to serve the Chandler family. (423) 743-1380.